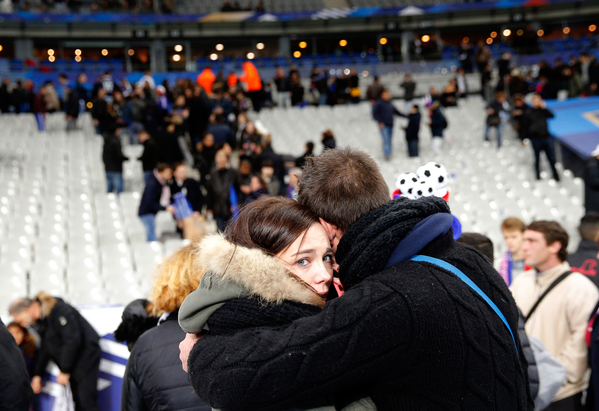 At least 26 people have been killed in attacks in and around Paris, French police have said. 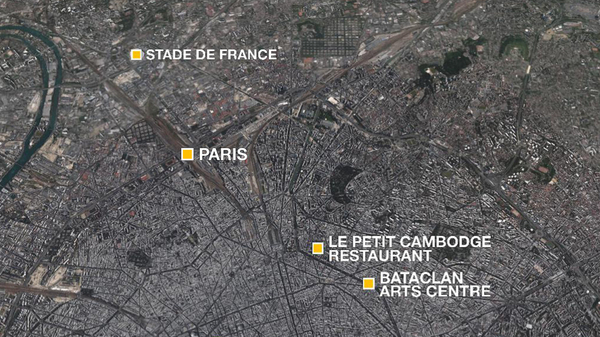 French police said a gunman opened fired with a Kalashnikov at a Cambodian restaurant late on Friday. 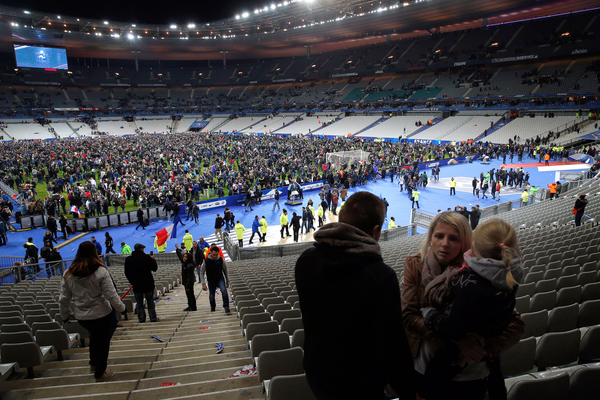 Officials also said there have been two explosions near the Stade de France stadium where a France-Germany friendly football match was taking place. It was unclear if the events were linked. 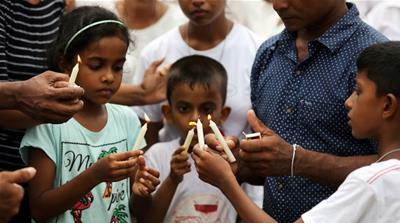 US officials believe that the attacks were coordinated, an official tells the Reuters news agency. Al Jazeera's Jacky Rowland, reporting 500 metres where a hostage situation is going on in Paris, says more than 100 people are reported to be taken hostage in the Bataclan concert hall in the city. Police and firefighters have been moving to the area towards the concert hall, she said, adding that the number of attackers are still not clear. The attackers who entered the hall shouted and "Allahu Akbar" and "This is Syria" before they started firing their weapons inside the Bataclan concert hall, she added. French President Francois Hollande has said a state of emergency would be declared across France and national borders shut following a spate of attacks in Paris in which he said dozens were killed. 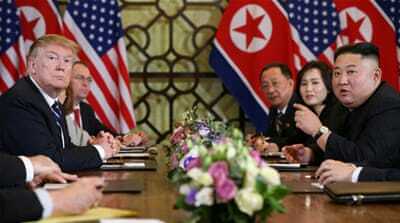 Hollande said in a brief statement on television on Friday evening that a cabinet meeting had been called. 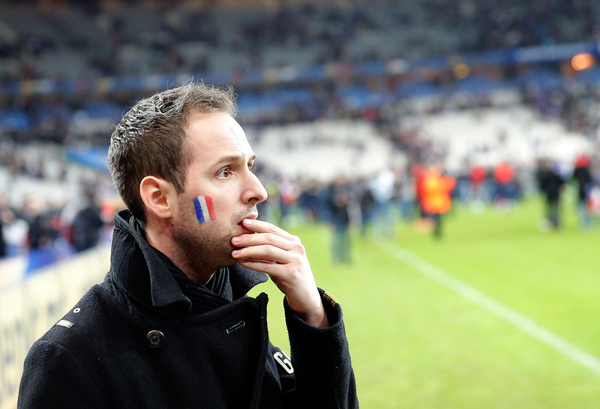 "A state of emergency will be declared," Hollande said. "The second measure will be the closure of national borders," he added. US President Barack Obama has pledged his government's support to France on Friday after a series of attacks in Paris, but said he did not yet know the details of what had happened and that the situation was still unfolding. 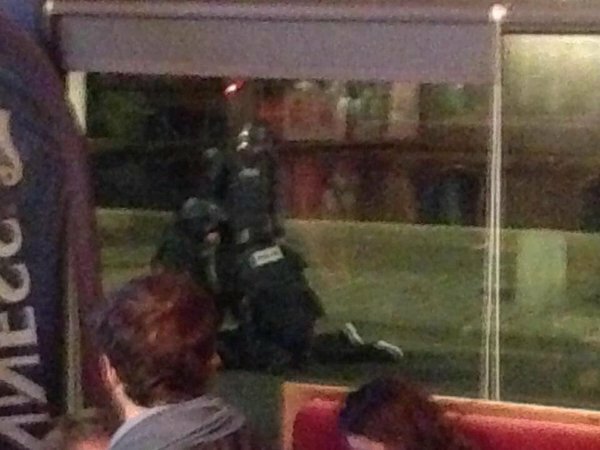 This tweet, which cannot be confirmed by Al Jazeera, says that the photo shows one person being arrested outside Bataclan Concert Hall. 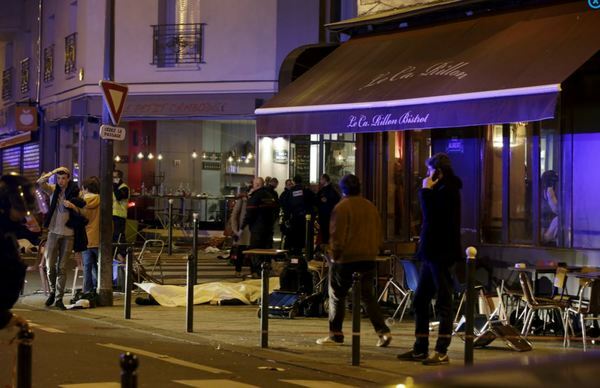 Read the latest developments on the Paris attacks on the Al Jazeera English website here. Automatic gunfire heard from outside Bataclan Concert Hall in Paris, where attackers are holding hostages: the AP news agency. Five explosions heard near the Bataclan Concert Hall Paris: Witness tells the Reuters news agency. 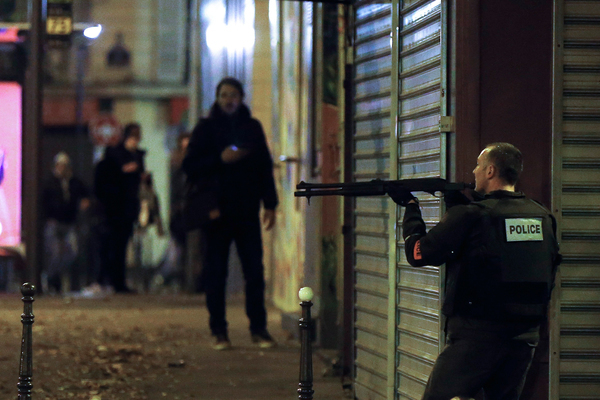 Latest: 45 reported dead in the Paris attacks, more than 100 are taken hostage. Police officials confirm that security forces launched assault on Paris Concert Hall, according to the Reuters news agency. 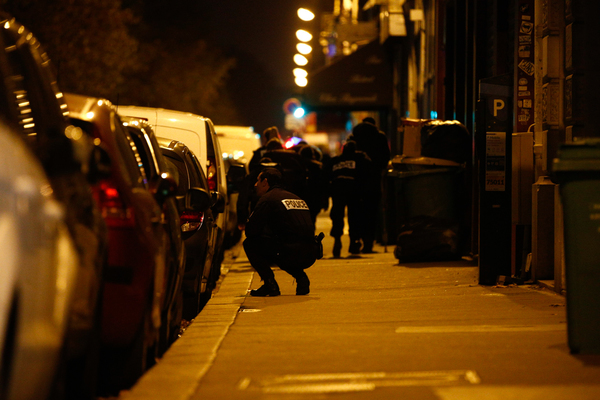 The series of attacks carried out in Paris took place in seven different locations, the AFP news agency quotes police sources as saying. 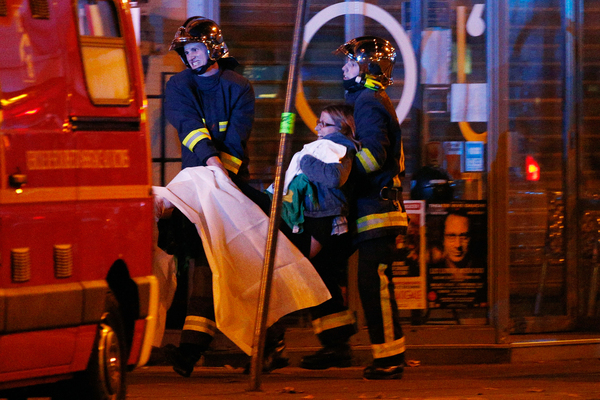 France's BFMTV says assault at Bataclan Concert Hall has ended, two attackers have been killed. Witnesses talk to Al Jazeera English. French President Francois Hollande has cancelled a planned trip to Turkey for the G20 summit of the world's 20 largest economies following the Paris terrorist attacks, according to the French media. France will be represented at the summit, which gets underway on Sunday, by Foreign Minister Laurent Fabius and Finance Minister Michel Sapin, the AFP news agency says. 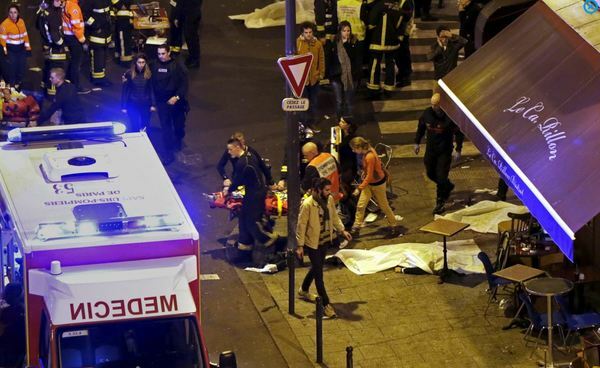 Police sources tells the AFP news agency that at least 100 people have died in the multiple attacks in Paris. 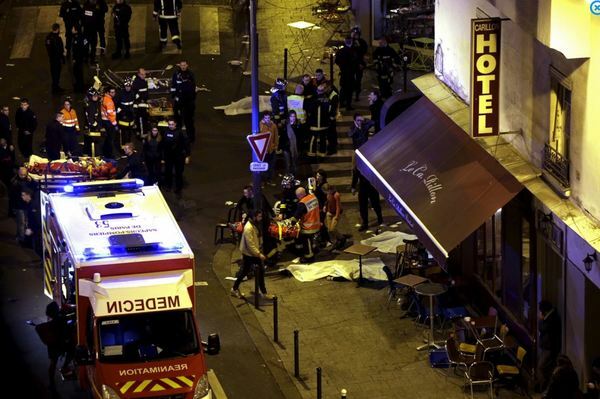 About 100 people have been killed in the Bataclan concert hall in central Paris and 40 others have died in other locations in and around Paris, an official at Paris City hall has said. We have, on my decision, mobilised all forces possible to neutralise the terrorists and make all concerned areas safe. I have also asked for military reinforcements. 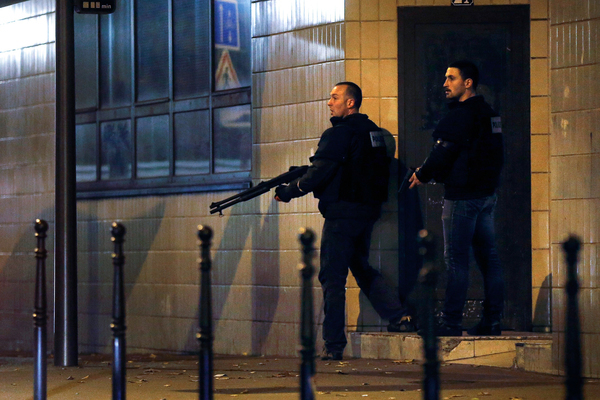 They are currently in the Paris area, to ensure that no new attack can take place. I have also called a cabinet meeting that will be held in a few minutes. In these difficult moments, we must - and I'm thinking of the many victims, their families and the injured - show compassion and solidarity. But we must also show unity and calm. This video, which Al Jazeera cannot independently confirm, reported to show the scene after the attack at Bataclan concert hall. 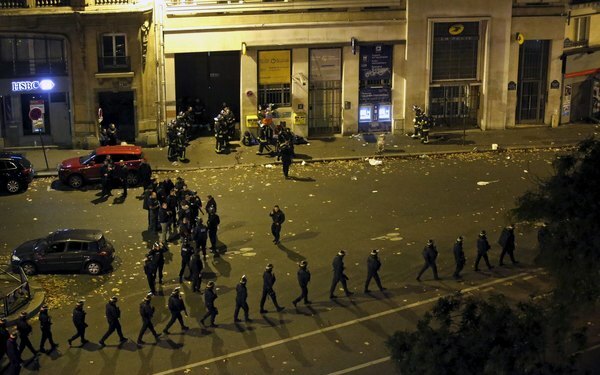 The French Presidency has deployed 1,500 extra soldiers to Paris. The presidency also declared a state of emergency across the country and said that all the borders have been closed after multiple gun and bomb attacks rocked the city. Turkish President Recep Tayyip Erdogan has offered his condolences after a string of deadly attacks in Paris late Friday, calling for "a consensus of the international community against terrorism". "As a country that knows very well the manner and consequences of terrorism, we understand perfectly the suffering that France is experiencing now," he said in a short televised statement. Gunmen who stormed a Paris concert hall killing several people and taking hostages have been killed, French President Francois Hollande has said, adding that France would be ruthless against those who carried out the attacks. "The terrorists who were not far from here were killed," Hollande said on television after visiting a security command centre near the Bataclan concert hall where the gunmen held people hostage before an assault by security forces. 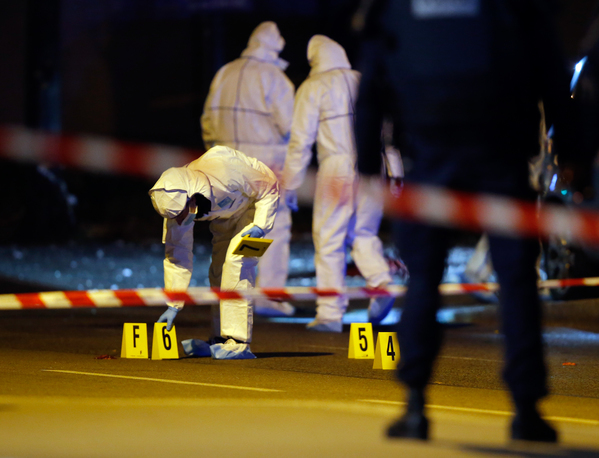 Paris Public Prosecutor Francois Molins has said in a television statement that at least five of the assailants have been killed. He also stated that the death toll could reach over 120. Facebook has launched a check-in feature to let people know that friends in Paris were safe after a series of bombings and shootings in the French capital killed at least 120 people. The "Paris Terror Attacks" safety check let people signal whether they were out of harm's way, then notified all those they know at the leading social network. The Belgian authorities have said that they have boosted checks on their borders, especially with France, following the attacks in Paris that have left at least 120 people dead. "Reinforced border checks have been established on the borders within the framework especially of a close collaboration with the French authorities," Belgium's national centre for threat evaluation, OCAM, said on Saturday. The vine posted by Umut.Uras 2:00 AM is not at the Batalan, it is a bar off Rue Faideherbe and Rue de Charonne in the 11eme arrondissement. 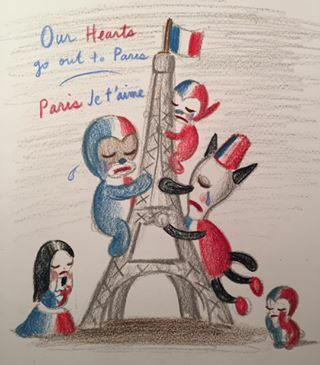 Our HEARTS go out to PARIS. American Airlines Group, the world's biggest carrier by passenger traffic, has said that it was delaying flights to Paris in response to the explosions and shooting attacks there, even though French airports remained open. "Currently Charles de Gaulle International Airport is open, however, we are holding our remaining departures this evening to Paris until we have additional information," American Airlines spokesman Joshua Freed said.